The Swedish equipment manufacturer Ericsson has bagged a new contract from the telecom giant Bharti Airtel to deploy VoLTE technology for the company and IP Multimedia Sub-systems (IMS), as reported by ET Telecom. This move comes in the light of Bharti Airtel’s strategy to combat Reliance Jio, the rival telco which was also the first one to deploy nationwide VoLTE technology and VoLTE calling with its arrival in the market in 2016. This is the first time that Ericsson has bagged a VoLTE contract in India. Until now, Nokia has been the sole provider of VoLTE technology in India to the major three telcos, Reliance Jio, Bharti Airtel and Vodafone Idea. In its report, ET Telecom highlighted that with granting this new contract to Ericsson, Bharti Airtel has adopted a multi-vendor approach for its network in India specifically speaking for VoLTE service. As per another report dating a few weeks back, Bharti Airtel had granted a major Rs 402 crore contract to the Finnish telecom equipment manufacturer Nokia. It is worth noting that currently, Bharti Airtel is offering VoLTE services in 21 circles in India with Jammu & Kashmir being an exception. 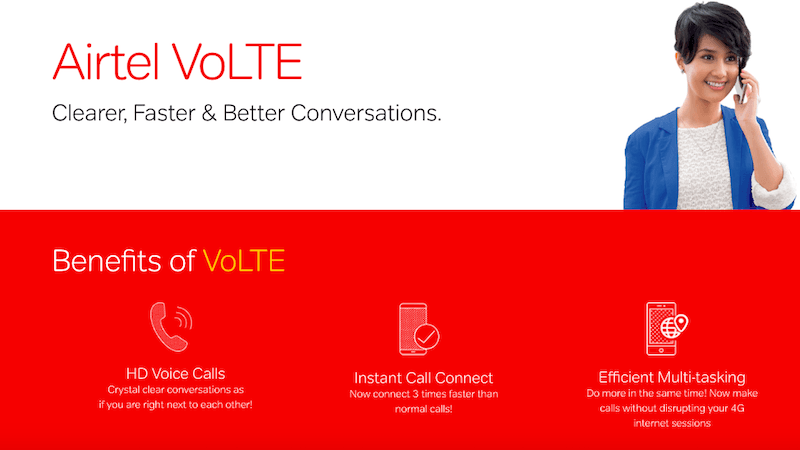 With this new development, Bharti Airtel CTO, Randeep Sekhon also commented, as he said, “With this, we are introducing a new vendor for VoLTE. The contract is for one circle initially, but the scope can be increased.” However, there has been no hint about the value of the new contract which has been assigned to Ericsson. Sekhon also said that the development is only in initial stage right now and he also did not make any comments about the timeframe of the deployment for VoLTE technology based on Ericsson’s services. When posed with questions, Ericsson did not return any answers. The significance of VoLTE is that with its deployment, the operator can offer both voice and data without needing to switch between bands. With VoLTE, voice is just another application that rides on an LTE data network. Notably, Reliance Jio has used the VoLTE technology in its first iteration only for its pan-India rollout. However, Airtel and Vodafone Idea are the telcos which also offer calling on the conventional circuit-switch technology. In its mobility report, Ericsson has highlighted that by 2023, India is likely to have 780 million voice over LTE (VoLTE) subscribers, while the total count of mobile subscribers will increase by two and a half times and will cross the figure of 975 million. Ericsson has also been Bharti Airtel’s managed service partner since 2004. The Swedish manufacturer also manages 2G, 3G, 4G/LTE, intelligent network and LAN/WAN for Bharti Airtel. In the start of 2019, Ericsson and Bharti Airtel also signed an artificial intelligence and automation deal. The manufacturer will now help the telco in solving network complexity issues and boosting user experience. Airtel and idea volte (Gujarat circle ) much much better than RJIL. Jio has downgraded volte bit rate to adjust the bombardment of Jiophones using the same. Also, Jio isn’t providing interconnect to volte of other networks, Airtel to Idea gives proper handover of volte not vice versa. This is good move atleast 2 vendor in industry. i thought Rjio using Samsung VoLTE. Also second news is about 2100Mhz used in top revenuenue generating circle for 4G. @TT and Chetan what is status of docomo deal? when airtel can able to use its’ spectrum. Airtel is really planning to drop 850Mhz ( unliberalasied) and not planning for use of Liberalised 850Mhz? @all share your Airtel Volte Working in roaming circle Result? Airtel be focus on Wired broadband also, otherwise 2nd position will also lost to JIO once Gigafiber comes. So by the time Airtel stablize 4G on 2100Mhz, It will get another block from tata’s 3g spectrum.. So this will again improve average download speed on Airtel network, and Airtel remain No 1 in providing Highest speed and best quality network, but still patchy network (4Gcoverage is still 50-80%). And i hope Rcom-rjio will also finalise something by june 2019.and BSNL also advance for 1block of 3g spectrum used for 4G. so we can clearely see 4-4G network competing from Jul 2019.